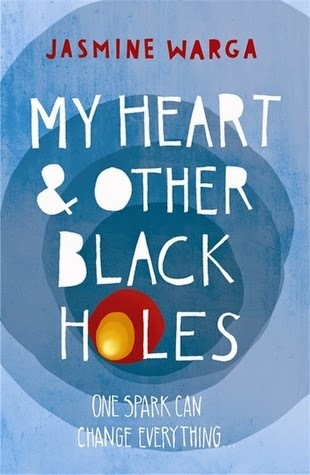 I didn't know anything about My Heart and Other Black Holes by Jasmine Warga when I first started reading it. And while I don't normally prioritise unsolicited review books, I was really attracted to both the cover and the unusual title for this book and so it landed on the top of my TBR pile. And I liked it. I thought it had a great message. Suicide is one of those topics that I'm seeing more frequently in young adult fiction. I'm both happy and saddened by this fact. Happy that there's more representation but also saddened that it feels so necessary to talk about depression and suicide and suicidal thoughts. This book in particular brings up suicide support websites and also suicide partners. I hadn't really given much thought to such websites but I hear they are becoming more frequent which I find utterly disturbing. My Heart and Other Black Holes tells us this story from teenage girl, Aysel's perspective as she meets another teenager, Roman, and they decide to become suicide partners and to commit suicide together in a month's time. This story spans that month between this partnership and the agreed date and in the meantime we find out more about Aysel and about Roman and why and how they got to that point where they want to end their lives. And we also see Aysel slowly change her mind through this connection and friendship with Roman. I really enjoyed getting to know both Aysel and Roman and hear about their experiences and reasons for committing suicide. They're both really interesting characters and in particular I really enjoyed the fact that Aysel is a big physics nerd. She takes these different physics concepts and tries applying them to her life and it makes her question things in a way that I found fascinating. And while perhaps there's less of that sort of character development with Roman, I still really enjoyed this friendship between the two main characters. I think my only really complaint about this book is that the ending feels a little bit too rushed for my liking. So while there wasn't quite enough time for to believe in certain thoughts and feelings and developments, I still really connected with what I thought the book's main message is. It was beautiful and sad, a little romantic but ultimately hopeful and I really recommend it. I just heard about this book and the premise sounds so intriguing. I will definitely be checking this one out. I received this one as well, Maybe I should bump it up the queue a bit! I think it'd be a good idea!